Baz embraces the force and slices his way through a trippy techno VR world. There is a psychological phenomenon that many games tap into, colloquially called ‘The Zone’. It is that feeling of bliss and zen that often accompanies the absolute focus of games like Tetris or Guitar Hero. 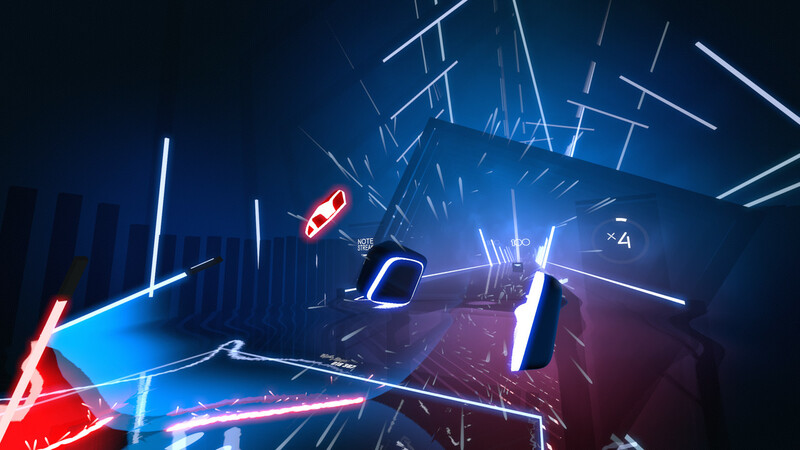 Beat Saber also taps into this phenomenon, but in a sub-category that I have started to think of as ‘the cool-zone’ – because not only does it make you experience those wonderful feelings associated with ‘the zone’, but it simultaneously makes you feel like an absolute badass. 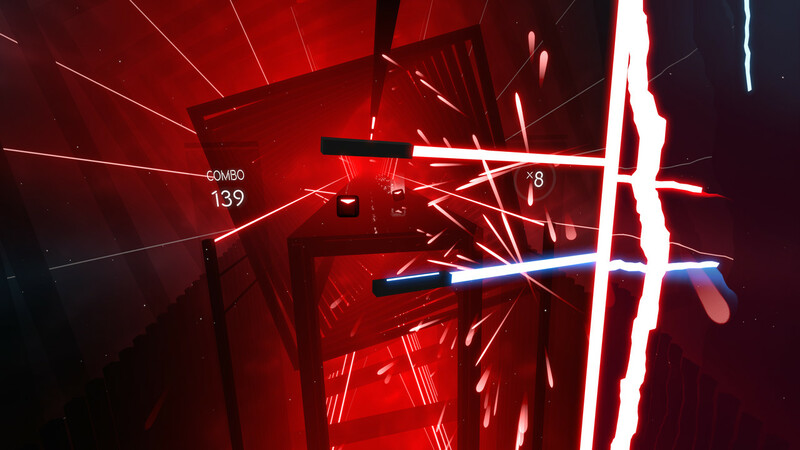 In Beat Saber, you wield two energy swords – one red, the other blue. To the beat of music, coloured blocks move towards you with indicators of which direction you need to slice them with these swords. The game slowly layers on various difficulty modifiers and additional challenges – but this is the fundamental experience. However, it’s not necessarily the premise that makes this game shine – I mean, there are probably hundreds of phone games with nearly indistinguishable mechanics. What makes this game great is its incredible execution and deep understanding of what a VR experience should be. 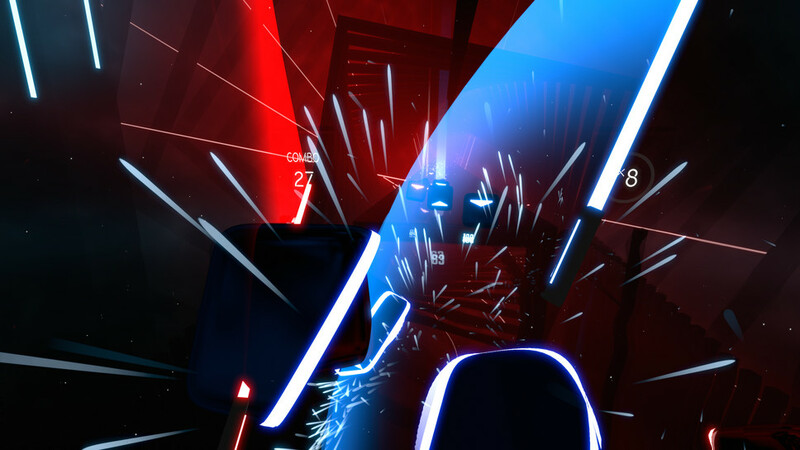 In fact, there are perhaps no VR games that have accomplished immersion as well as Beat Saber does. The game's sense of immersion doesn’t come from surrounding you with great open worlds to explore, but by using the VR environment to enhance the components of its experience. 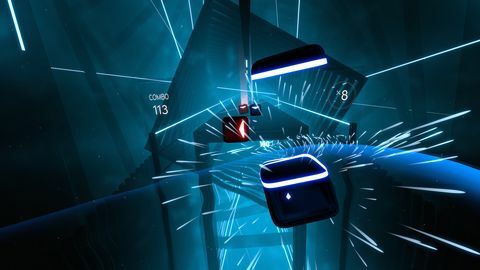 After all, this game could be played on a screen, but there is no way it would be as powerful and riveting as when the world around you is pulsing to the beat of the music and the abstract vaulted black room adding an incredible sense of scale. But the real joy of the experience is in how it feels to slice through the blocks in time with the music, and the visceral feeling of doing so in the world-scale of VR. Rhythm games have always tapped into some deep satisfaction at combining an action with a beat – now, imagine combining that rhythm pleasure with every Jedi lightsabre fantasy you have ever had. As I chopped my way through red and blue blocks, bopping to the beat and ducking and weaving my way around obstacles, it was impossible for me to do so without a huge grin on my face. I know that I must have looked ridiculous from the outside, but in that world, it is hard not to feel powerful and supremely cool. It is also very easy to lose yourself in that world and forget about the real-world outside the headset – not something I can easily do in VR. The focus the game requires is definitely part of this, but there are a lot of little touches which also enhance this sense of immersion. For instance, the rumble in the controllers makes the swords feel incredibly real. Even though you are only holding controllers - essentially the hilt of the swords - when you hold the blades together they rumble as if repelling each other, creating a very real sense that the blades have substance. The music also plays a huge part in what makes this game so great. Though the tracks weren’t always to my taste - with most of the tracks representing a sickly-sweet amalgamation of synthpop and drum and bass – they are all perfectly suited to the gameplay, and each offers a driving pace and accented rhythm to choreograph the gameplay to. There are a number of ways to engage with this brilliant rhythm gameplay loop. The game features a campaign mode which challenges you with an increasingly difficult series of songs and challenges. Though the choreography of the tracks themselves can be quite difficult, it is the additional obstacles and criteria which really up the difficulty throughout the campaign. For instance, in the hardest mode the directional signs fade off the blocks as the approach you, so you have to memorise future blocks on top of slicing and dicing those in front of you. 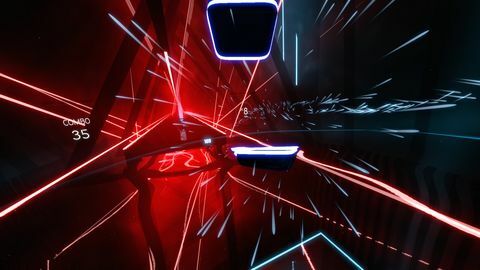 Beat Saber is possible the best VR experience ever made. It is an incredibly satisfying rhythm game which uses the immersion of VR to evoke a sense of scale, power and energy that hugely enhances the underlying gameplay loop. The mechanics, music and VR environment tap into something deep in your psyche that creates an irresistibly fun and empowering experience.